Even if he were to just pack it up, call it a day, and be done with his altruistic efforts, he has already surpassed what many others have done charitably over the course of their entire lives. This is an excerpt from one of my favorite quotes by Emerson. I open with this because the man I'm about to introduce you to has already done just that. Even if he were to just pack it up, call it a day, and be done with his altruistic efforts, he has already surpassed what many others have done charitably over the course of their entire lives. Eardly Wickramasinghe, MD, is a family medicine physician with the Saint Vincent Health System. 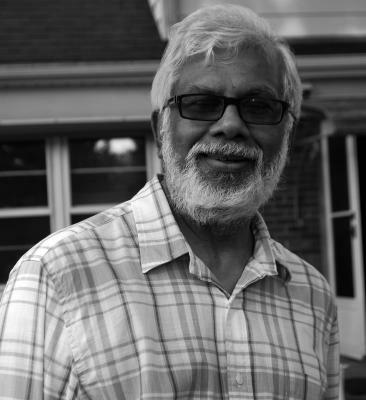 Originally from Sri Lanka, he arrived in our fair city in 1972 to complete his internship in family medicine. And basically he never left. In 1976, he started as an emergency room physician with Saint Vincent's, and in 1979 he went into general practice with the hospital, holding this post ever since. This is pretty much all the information I pulled from Dr. Wick (the name he goes by) when I sat down with him the other day in the makeshift coffee shop within the hospital atrium – and I'm only half joking. As we're sitting at the small café table, I ask him questions about his charitable work, which are often responded with only a nod of the head or yes or no answers. I think, here is a man that I know has done great things for others locally and abroad, and all I can mainly pull from him is basic biographical information. He's clearly very uncomfortable talking about himself and the work he's doing beyond the standard duties one's called to as a doctor. And I find this to be refreshing and endearing. Through the little he does share, I immediately recognize his efforts are being conducted for the right reason – unselfishly giving back only for the welfare of others. In a world in which the lot of us can't go five seconds without posting what we're doing on some social media outlet, or we do things with some ulterior motivation, here is a man who gives much of his time and energy to others – and doesn't want to tell me a thing about it. However, it's too bad for him that the fine editors of the Erie Reader still want all of you to know him. So, I tell him out loud that I'll pull the details from others, and I think to myself, I'll only ask questions that need either a nod of the head or few words. What I immediately surmise – from what he willingly shares – and Janet Thompson, executive director of the Erie County Medical Society (ECMS), is that his efforts to help others really began back in 2004 and he hasn't let up since. On Dec. 26, 2004, when many of us were out of bed before daylight fighting obnoxious, massive crowds at our local malls or retail outlets, tsunamis swept across the Indian Ocean, spawned by a magnitude 9.0 earthquake. Aside from Indonesia, the death toll of the island nation of Sri Lanka may have suffered the most casualties, reporting in at 21,715. Thompson tells me that it was this catastrophe that inspired Dr. Wick to inaugurate the ECMS effort to raise funds to help the victims of the tsunami. And I can understand why, as this is home turf. I learn Dr. Wick worked tirelessly on both sides of the ocean – locally, he oversaw the collection efforts, and overseas in Sri Lanka, he helped with the distribution of the money and products collected. This effort alone raised over $180,000 and collected 139 cartons of medical supplies, which ultimately made the reconstruction of an entire community of homes in Sri Lanka (read: 32) possible. Erie, you should be proud. Dr. Wick was. In a moment of sharing, he tells me, "because of the outpouring, I felt I really needed to give back to our local community." Shortly thereafter, in 2006 Dr. Wick organized the "Start Your Day Right" breakfast food collection drive to benefit the Second Harvest Food Bank of Northwest Pennsylvania. When I asked him how much he collected, he laughed and said, "close to a ton." He didn't go on, however, but I wanted to find out if his assessment was correct. He actually low-balled that number just a bit. Through the 104 Erie County physician offices, 2,017 pounds of breakfast food was collected and distributed. Then in 2009, Dr. Wick initiated the "Sheltering the Community" program, which created and administered a team of ECMS physician-conducted medical clinics at the main homeless shelters maintained by the Erie United Methodist Alliance. According to Dr. Wick, "We saw the need for the uninsured and under insured to get health advice and preventive care and expose them to some of the services that are available locally, but they may not have access to." These clinics provide general medical assessments and screenings to many deprived parents and children. And again – then in 2010 – Dr. Wick led the planning and implementation of the Erie County Medical Society's "Health Fair in Perry Square." The fair, which still occurs annually, gives much-needed medical information and apprises members of the underserved community of the free resources available to them. And he does all this only because he sees a need. "Being a hospitalist, we saw a lot of people that when they leave here, we don't know where they're going. There's a need outside of their visits to help these folks so they'll take better care of themselves." And he's not done – not that this comes as a shock. "I see a lot of people in my practice that require a lot of medical attention – they are in and out of the emergency room too often. They have health issues that they can't seem to take care of properly. The ECMS is looking into a few projects to see how we can help them take better care of themselves outside of the hospital so that their trips here become fewer and far between." As for Thompson's take on Dr. Wick? "Dr. Wick dreams up patient-driven ideas and runs with them," she says. "His excitement for making a difference is contagious. He is such a pleasure to work with not only because he comes up with great ideas but more so because of his commitment to personally making a difference. Most of Dr. Wick's ideas get approved because the Board realizes that his passion will help to make things happen." "To laugh often and much, to win the respect of intelligent people and the affection of children, to earn the appreciation of honest critics and endure the betrayal of false friends, to appreciate beauty, to find the best in others, to leave the world a bit better, whether by a healthy child, a garden patch, or a redeemed social condition, to know even one life has breathed easier because you have lived, THIS is to have succeeded." I'd say Dr. Wick's already done this – and more. Through these conversations and research it becomes clear that Dr. Wick lives his life by his actions and not his words, that he believes that what he does for others is all part of life's daily routine, that he deserves no recognition or praise for his work. These are all truly selfless, compassionate acts – ones we can learn from in hopes that we too can give back or pay it forward. And given that we are all things Erie, we want all of you to know we notice these deeds and whether it's wanted, they are well deserving of recognition. So, thank you Dr. Wick. And Erie.